Rooibos has been getting an amazing amount of press recently. As people begin searching for healthy alternatives to soft drinks, rooibos, with its polyphenols, iron, zinc, fluoride, calcium and magnesium fits the bill. Enjoyed in South Africa for centuries, rooibos was first made available to Westerners by a Russian émigré named Benjamin Ginsberg. He recognized that its beneficial properties and wonderful taste made it an excellent caffeine free alternative to traditional caffeinated teas. We agree! Chai holds a warm place in the heart of India. Although it might sound odd that a scorching hot beverage be so widely enjoyed in one of the world's warmest countries, chai actually cools the body. It does this by raising core body temperature above ambient air temperature. But the best part of course is the exotic tapestry of spice that weaves through each flavorful sip. NOTE: Like our teas, all spices sourced for these blends were grown in sustainable environments. Fruit n Herb Tea offers a healthy alternative to sugared sodas, soft drinks and artificially flavored tea-type drinks. Our herb & fruit teas taste better than all the above, (in our humble opinion), have no sugar, and are really good for you, (they're packed with Vitamin C - who can argue? ), Oh, and there's one more thing. These are absolutely fabulous when brewed to make iced tea. Herbal Teas are the first known instance of herbs being collected for the purpose of ingesting them. Recent archaeological findings appear to indicate that even way back then, our relatives living in Iran understood the many ways that herbs can heal and soothe the body. So raise a cup to the past! Or, use our herbals to concoct your own custom tea blends. Organic Black Teas help maintain a smaller environmental footprint. How does an organic tea farm operate? • Abstinence from using any synthetic fertilizer, pesticide or herbicide. • Environmental protection of lands surrounding the gardens. • Replenishment and maintenance of garden soil fertility using natural means. • Promoting and maintaining biodiversity in the gardens and surrounding lands. Loose Leaf Green Teas have been scented and blended for centuries. In ancient China, tea artisans developed many different methods for creating fruit and floral blends to tempt taste buds and delight the senses. Our flavoured green teas are an updated example of this continuing tradition. All natural flavours, premium fruit and flower pieces blend harmoniously with either a light flavoury Sencha or medium bodied Gunpowder style leaf. What makes our Flavoured Black Teas stand out from the rest? Premium leaf: Light & flavoury 100% exclusive High Grown Ceylon teas from estates above the 5500 ft level. 100% All-Natural Flavoring: Pure flavouring oils with no chemical residue or aftertaste. Ethical Production: Many tea manufacturers use inferior leaf from questionable sources to make flavoured teas. The belief is that flavouring will mask the character of poor tea. 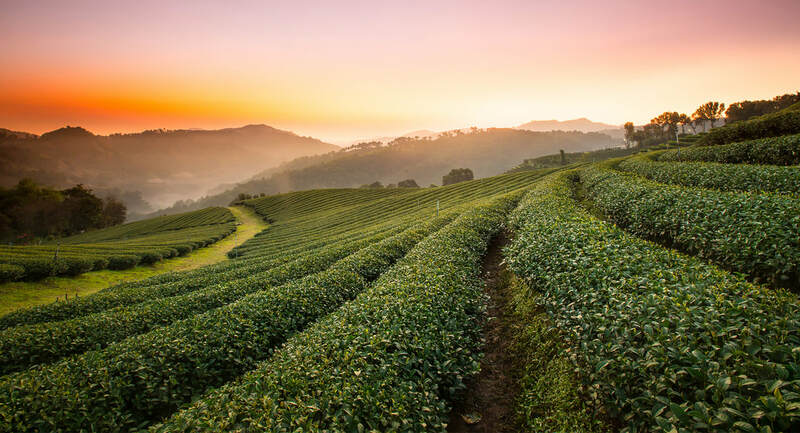 Our teas are sourced from premium ETP certified estates and our chemical free process means they taste great and are good for the earth at the same time.